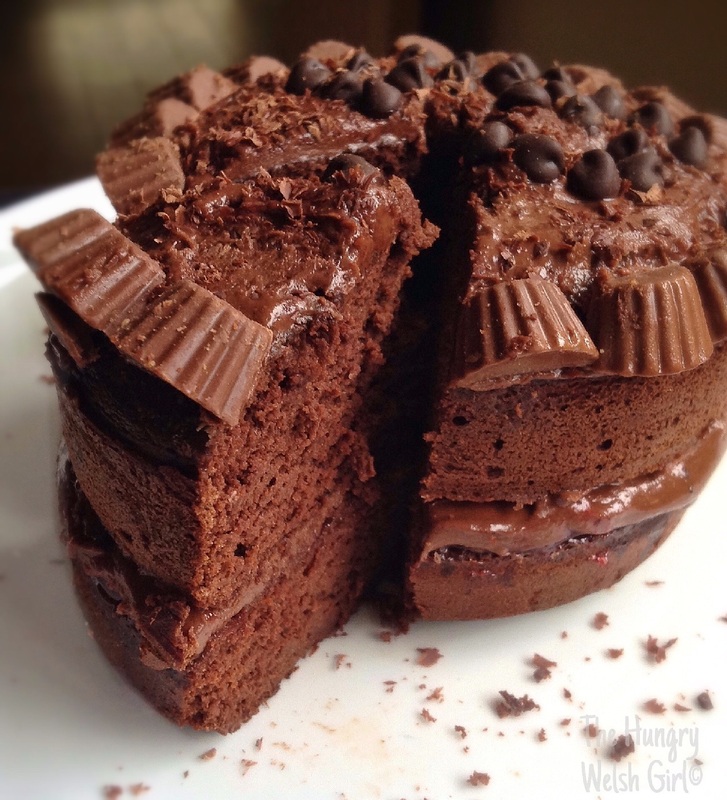 Peanut Butter & Jam Chocolate Cake. I made this peanut butter and jam chocolate cake, all the way back in January for my 26th Birthday. I have been meaning to post the recipe for a while because it really was very delicious. It was my first time baking a cake with coconut flour and thankfully it turned out perfect, I would have been devastated if it hadn’t because who wants dry cake on their birthday. Initially the cake was meant to be a healthier version of the average chocolate birthday cake, but then I thought to myself – Do I really want a healthy cake on my birthday? And the answer was obviously a huge NO. So I added Reece’s peanut butter cups and a lot more peanut butter than I first intended. But hey, it was my birthday and getting old deserves to be treated. And I wasn’t feeling especially happy on the day, so I needed a little pick-me-up. Add the apple cider vinegar to the milk and heat in the microwave for 1 minute. This will make buttermilk. I find buttermilk helps the texture of the sponge. Next you will need to add the butter to the warm milk and stir until the butter has completely melted and then add the bicarbonate of soda and stir. Following that add the; coconut flour, eggs, honey, cocoa powder and stevia to a food processor and blend until the batter is smooth. Add the buttermilk and again process the batter for 2-3 minutes. Now grease two 5′ cake tins with a small amount of butter and equally fill both of the cake tin’s half way. Hit the tins firmly on a counter to remove any air bubbles from the mixture and pop them into the oven at 175c for 25 minutes. Check if the cakes are cooked by inserting a knife or skewer into each one, if the knife comes out clean then your cakes are cooked. Transfer the cakes to a cooling rack. Now that your cakes are cooled you can decorate. To decorate: Spread a layer of peanut butter on one cake, the other with the jam and then sandwich together. Try not to add too much filling, otherwise the cakes will slide. Now do the same to the top of the cake with the rest of the peanut butter and decorate with peanut butter cups, chocolate chips or whatever you fancy. Enjoy and if you do make any of my recipes be sure to tag me on Instagram: Happy.Hungry.Healthy. Hashtag: #TheHungryWelshGirl. I would really love to see what you create. Also, please show the love by sharing to social media or Pinterest, by clicking on the links below. Chickpea & Lentil Burger’s; with Spicy Guacamole. Eating Healthy: Is It Really That Expensive? Going to give this a go, how much bicarbonate of soda should I use? And would golden caster sugar do instead of stevia?